Your role as a front line worker is the key element in The Right Place initiative, connecting people with the right services at the first point of contact. The Right Place postcard is an important component in this initiative. It can be used however works best at the time. It may be writing down an appointment, a name or a phone number; it may be drawing a map! Feel free to use it in whatever way will be most useful to the person you are helping. 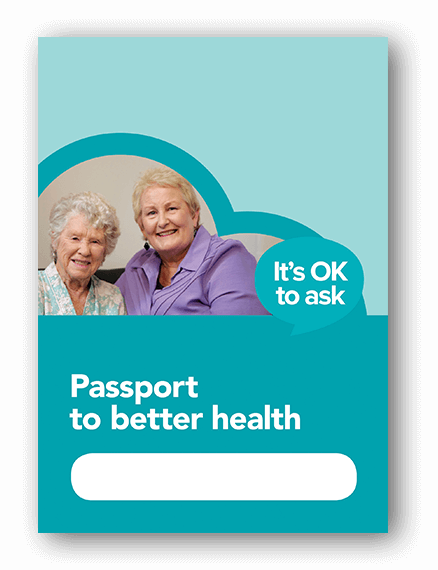 The Passport to better health is a consumer tool that has been designed to support people to manage their own health journey. It uses easy to understand language and provides a way for consumers to keep track of information that is relevant to their health management. It is not intended to be a complete record of a person’s health status, but rather a way to encourage and support people to take ownership and feel in control of their health journey and health care decisions. Can you help the person here? Always acknowledge a person when they enter your service, even if you’re busy. For example, “Hello, I’ll be with you in just a moment”. If you’re on the phone, it helps to make eye contact and nod or smile. The person then knows that you’ve not only seen them, but also that you’ve acknowledged them. Nobody likes to feel invisible! “How may I help you?” is always a good start. Sometimes people don’t know exactly what they need, so some gentle non-intrusive questions may help to work out what sort of service the person may be seeking. Be aware that the way you respond can make an enormous difference to a person who is experiencing difficulty in their life. If your organisation provides an appropriate service, that’s great! The person is already in The Right Place. You may already know the right service to assist someone. If not, you have a range of resources available to you to use. a short list of local services which may be especially useful if you don’t have ready access to a computer. If you are unable to decide on The Right Place to direct the person, call one of your key contacts, using your own list. Each The Right Place community will have a local ‘home’ which is usually the next point of enquiry if you need assistance. Offer to make an appointment for the person, if they wish. Alternatively it may just be letting the next service know that this person is on their way. The Right Place is about actively connecting people with health and community services – the best and quickest way is to suggest you make a phone call for them. For every enquiry, where possible, write out a postcard for the person so they know where they’re going and when. It can also be a visual reminder to the person if their memory is patchy. Offer a copy of the Passport to better health if it seems appropriate. Record the enquiry on the Enquiry Tracking Form. walking with the person to another service. The key elements to helping connect people with the right place for them, are making the phone call and writing out the postcard. These two actions together create the connection between the person and the next service. Each enquiry will require you to make a judgement about the best method to assist the person. The important thing is to help the person connect with the right service for them – The Right Place. Key contacts are an especially useful resource for participating organisations and staff when your existing tools aren’t quite enough. 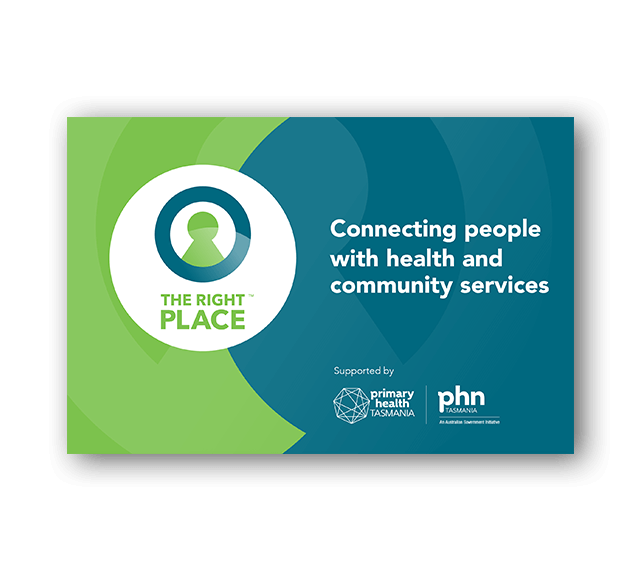 People and organisations on this list are familiar with The Right Place initiative, know how to use the resources and have a good knowledge of local health and community services in your area. The best key contacts are people or businesses with whom you have an existing relationship, so we encourage you to expand your list as The Right Place network grows. When you learn of a new service or resource, you might like to make a note on the Additional Resources page. If you need additional supplies, please contact your local The Right Place community. Want to become a member of The Right Place?